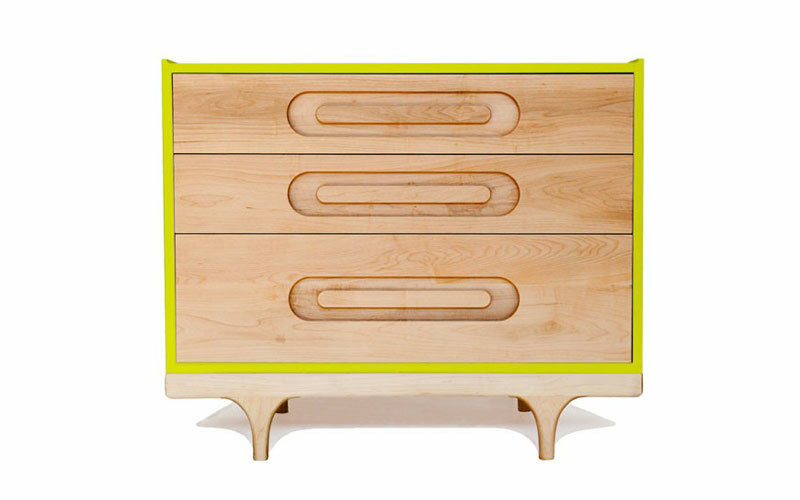 The beautiful Caravan Dresser from Kalon Studios is a perfect match for the equally colorful Caravan Crib. However, the Caravan Dresser also stands well on its own, even in an older child’s bedroom — you don’t need the matching set. The Caravan Dresser is available in six bright, contemporary colors and will look stylish in any setting. Lovely integrated drawer pulls give the dresser a streamlined, yet dynamic look. The Caravan Dresser is made with high quality FSC-Certified domestic solid maple and birch panels. The piece is finished with GreenGuard certified 100% non-toxic, low VOC, HAPs free paint and a natural wood oil. The beautiful Caravan Dresser from Kalon Studios is a perfect match for the equally colorful Caravan Crib. However, the Caravan Dresser also stands well on its own, even in an older child's bedroom -- you don't need the matching set. The Caravan Dresser is available in six bright, contemporary colors and will look stylish in any setting. Lovely integrated drawer pulls give the dresser a streamlined, yet dynamic look. The Caravan Dresser is made with high quality FSC-Certified domestic solid maple and birch panels. The piece is finished with GreenGuard certified 100% non-toxic, low VOC, HAPs free paint and a natural wood oil.